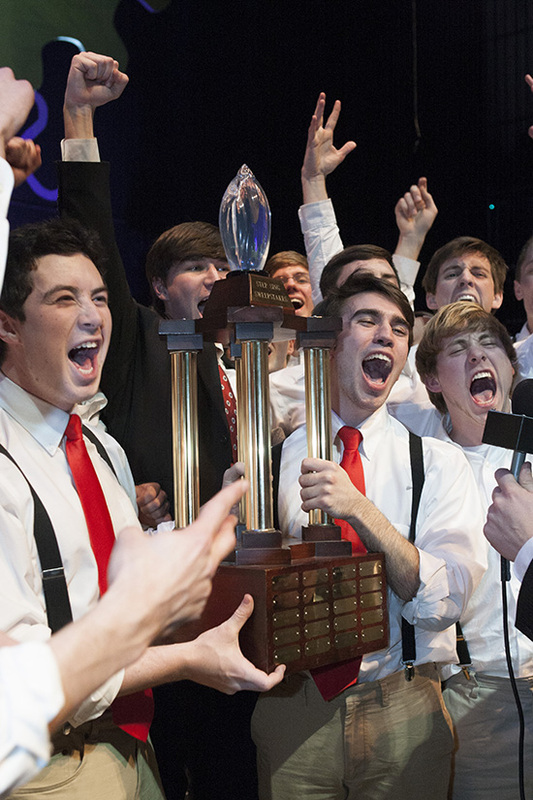 The men of Pi Kappa Phi won the coveted Sweepstakes Award Feb. 15 at Samford University's 2014 Step Sing. It was the second year in a row for the fraternity to take home top honors in Samford's student-produced talent show. With the theme "Call of Duty," the show used elections to "journey through the fields of democracy to exercise" the right to vote. Show directors were Drew Hall, senior marketing major from Madison, Miss., Brooks Hanrahan, sophomore Brock Scholar from Hoover, Ala., and John Hunsicker, junior biology major from St. Louis, Mo. "Without this group of guys, this would have just been an idea," Hunsicker said. "The guys executed what we gave them, and to win a second year in a row is a tribute to their dedication." Hall echoed Hunsicker. "We asked the guys to have fun. It took all 64 guys to put this together, and winning is an example of the type of brotherhood we have experienced this year." They also won the judges' award for excellence in music and the participants' choice award for music. The previously won sweepstakes in 2009 and placed in 2010 and 2011. Zeta Tau Alpha was first runner-up with "I Open at the Close," a circus theme about what happens behind the scenes after the show closes. Directors were Casey Cappa, a senior journalism and mass communication major from Goodlettsville, Tenn., and Katy Flinn, a senior journalism and mass communication major from Carrollton, Ga.
ZTA won the judges' awards for excellence in choreography and creativity and participants' choice awards for choreography and most entertaining show. The sorority won sweepstakes in 2003 and was second runner-up in 2012. Sigma Chi was second runner-up with "The Workshop," a Christmas-themed show about what elves do when Santa Claus is not looking. The group won the participants' choice award for favorite costumes. The previously won sweepstakes in 2008. Show directors were Jeffrey Ashurst, a senior kinesiology major from Montgomery, Ala., and Spencer Smith, a senior communication studies major from Nashville, Tenn. Freshman Ladies won the participants' choice award for favorite emcee. Show directors were Lindsey Anderson, a freshman pre-med major from Columbia, Tenn., and Caroline Burchett, a freshman nursing major from Clarksville, Ind. The Step Sing student coordinating committee inaugurated three new awards this year that were voted by committee members. Zeta Tau Alpha won the committee choice award for favorite moment. University Ministries won the award for favorite music, and Sigma Chi won the award for best directors. Chelsea Brown, a senior psychology major from LaGrange, Ga., and Allie Klaubert, a senior journalism and mass communication major from Dacula, Ga., were the overall directors. "The talent and energy that the participants brought to this year's show was amazing," Klaubert said. "We missed several days of rehearsals because of the winter storms, but everyone stepped up to ensure that the show truly would go on." The members of Alpha Omicron Pi sorority continued a multi-year streak as top participating fundraisers for the Step Sing philanthropy. The 13 participating groups raised more than $6,300 to support the Alabama Baptist Children's Homes and Family Ministries, a Birmingham-based agency of the Alabama Baptist State Convention. Samford also is affiliated with the ABSC. More than 900 students representing 13 different groups performed four shows in the 63rd anniversary production. The show is totally student-produced and professionally judged. It is considered one of Samford's most cherished traditions. A live stream of the Saturday evening performance was viewed as far away as Pakistan and Africa. Students and faculty spending the semester at Samford's London Centre viewed the show at 2 a.m. local time. Alumni in the Washington, D. C., area, gathered for a live stream watch party. Step Sing originated on the steps of Renfroe Hall on Samford's East Lake campus before the university relocated to its present location in the late 1950s. This was the 43nd anniversary for the Sweepstakes Award.